Master thesis: Science center of nano scale technology. I'm going to outline the project description more concisely without sacrificing visual materials. 1. 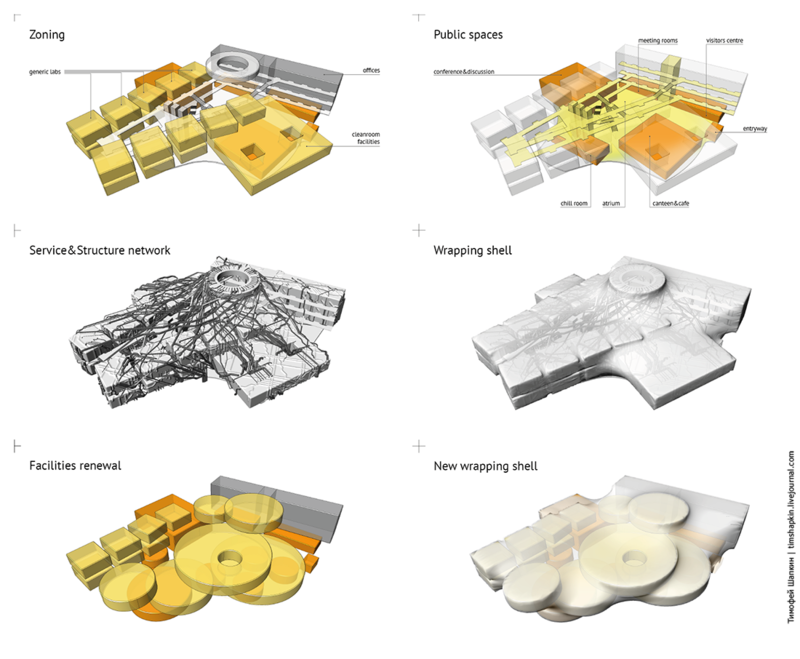 Adaptability as a solution to the problem of obsolescence of scientific centers. 2. Merger of utility service and bearing systems together. The problem of flexibility and adaptability in architecture excites the minds of architects for a long time. Architecture is a static art, but there were a lot of attempts last century in to endow it with the changeable features. 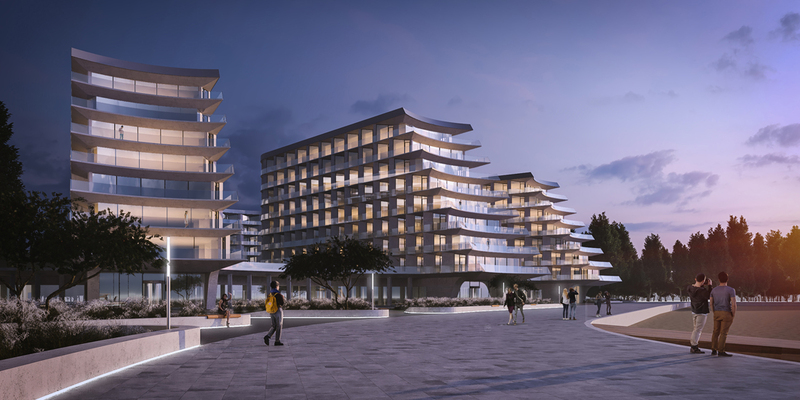 I'm not telling about transformable facades or shells, but rather the building capability to stand the profound inner program changes. The most successful existing example that is corresponding for such a requirements is Centre Pompidou in Paris. The ability to be completely reprogrammed is restricted only by it's physical dimensions. In Centre Pompidou there is a simple strategy used to get rid of any capital elements of inner space and pay it for the entire length, width and height at the mercy of exhibition curators. 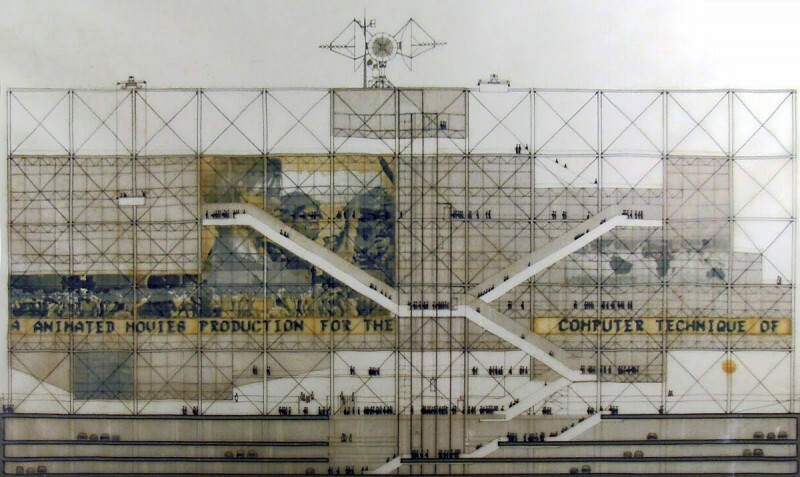 Centre Pompidou competition project, 1971. Richard Rogers, Renzo Piano. Centre Pompidou inspires us not only in terms of adaptability features but also in terms of external aestetics. We've tried to raise this both aspects to a new level. Let's continue with our project. Instead of cultural centre we design scientific centre where we have to change instead of contemporary art exhibitions the research and service equipment. So, why should modern research facilities have adaptive features? Last decades the scientific agenda changes rashly, so does the requirements for research facilities and equipment. 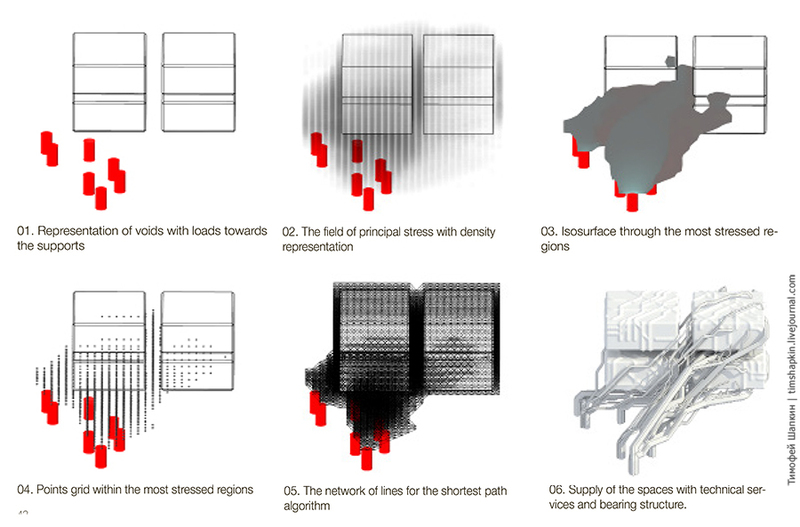 Steady-state essence of architecture can not keep up with the dynamics of progress. The scientific centers were built in eighties often couldn't be merely refitted according to the new requirements. For example there is not enough section space for the new more powerful air exchange systems. Or the materials were used to construct the building constantly produce unacceptable levels of dust. Or there is no opportunity to install new insulation from all sorts of vibrations and so on. Sometimes it's more easy to demolish the building completely and construct the new one. Bur is there any guarantee that the new center wouldn't become obsolete in a few decades? Obviously the project of the science center should have the mechanisms of adaptability because of periodically changing conditions. But nobody says the response to changing conditions should happen instantly. In our opinion the optimal update rate of research facility is 10-15 years. In this period the building does not manage to become outdated neither morally nor physically. How does this principle work I'll tell you a little bit later. And now let's speak more specifically about research facilities in nano scale field. The most complications consist in organization of laboratories and clean rooms. The requirements for them are changing depending on the equipment. Conditionally we can split all requirements in 4 groups: precise control of humidity and temperature, isolation from noise and mechanical vibration, air purification from dust particles, insulation against electromagnetic and radio waves. Sometimes the requirements to one facilities contradict to another. For example one measuring equipment in first lab requires frequent air purification using a ventilation system, which creates intolerant noise vibrations to another measuring equipment. So the architects or technicians should pay specific attention to locations of the labs and clean rooms in order to minimize mutual influence. In addition inner ergonomics of laboratories matters, location of service zones and so on. The complexity of technical requirements is so high that exceeds the competence of any architect. The laboratory facilities is the competence of narrow specialists-technicians. 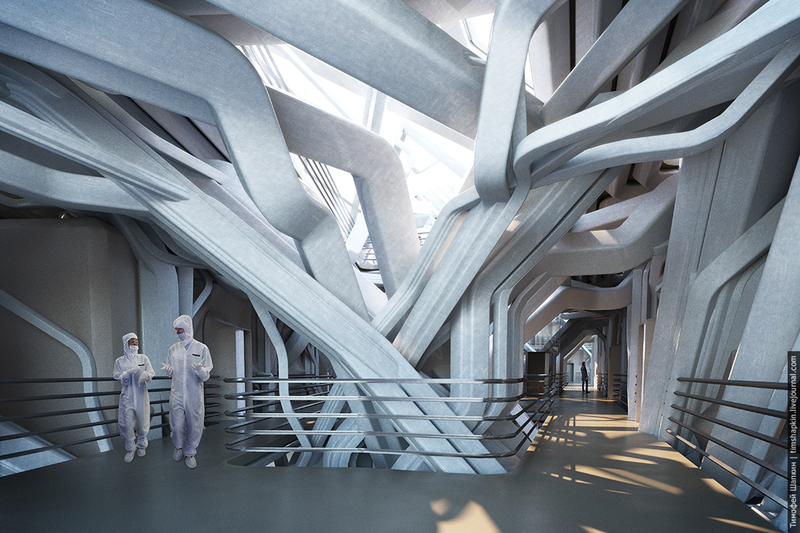 So we as architects have decided to engage ourselves with the space between laboratories and another functional volumes. In the focus of our attention were also public spaces, the personnel circulation and the problem of adaptability. Each lab has isolated box that is independently located in space. It kills two birds with one stone: additional isolation from external sources and possibility to be replaced without any affection to another boxes. 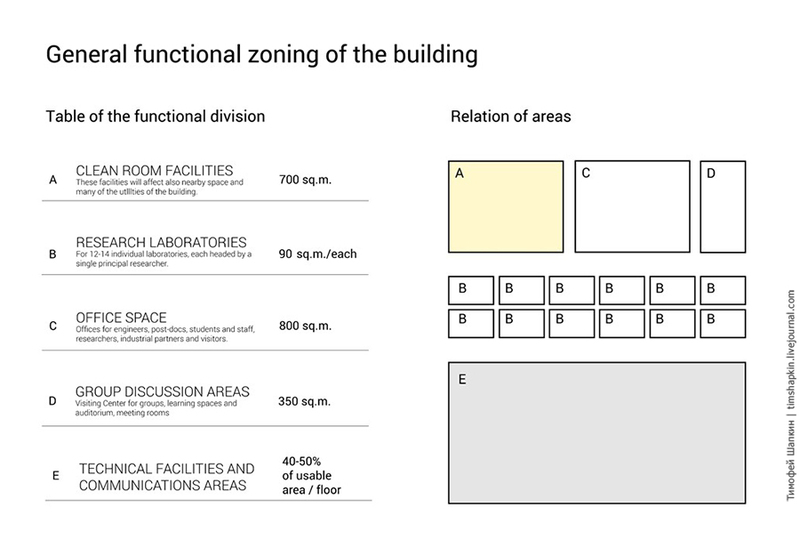 Auxiliary facilities such as canteen with kitchen, discussion room, visitors centre, office block have independent boxes in the same way which are scattered in space. The gaps between the boxes are used for bearing and utility service structures. The entire composition of the various functional modules is wrapped by shell to keep the necessary microclimate inside the science centre. 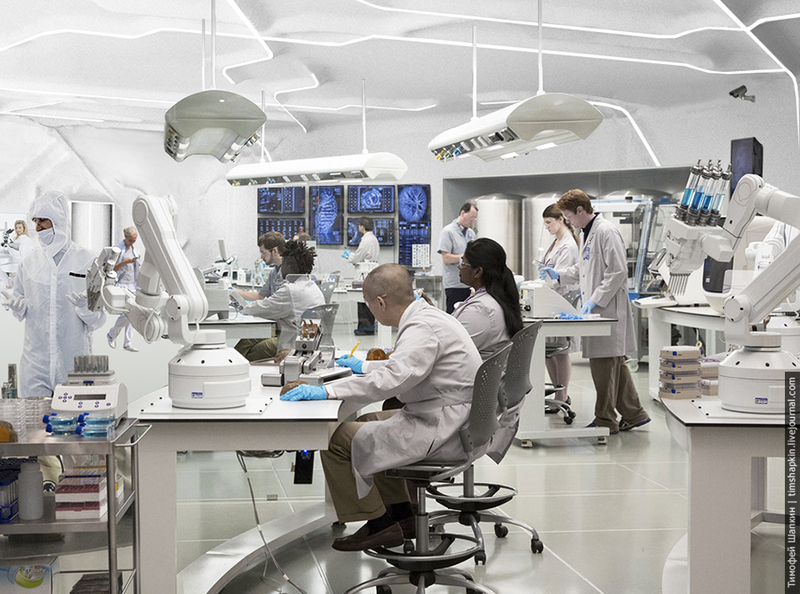 Let's imagine in 15 years some of the labs become obsolete that's why they should be replaced with new ones. Technicians say that now cylindrical labs are more relevant, comfortable and ergonomic instead of box-like labs. If they say cylinders, we'll deal with cylinders. We dismantle old boxes, bring fresh manufactured cylinders in conjunction with the equipment and install on a vacant place. After that rewrap it with protective shell. In 10 - 15 years the cycle repeats. Over a lifetime, the building will increase and decrease. The outdated usage scenario will be replaced by new one. Thus the evolutionary development of the building should be seen in exterior as well as in interior. 2. Merger of utillity service and bearing systems together. We gradually came to the second and subsequently crucial topic of our thesis. During analysis process of the analogs we noticed that the service equipment and ducts in research facilities occupy relatively much space. The service and usable area ratio reaches up to 40 percent. And it's not a wonder, because except standard service such as electricity, water and sewerage the research facilities require also conditioning systems with a high air exchange, submission supply of several types of gas. Channels, pipes, manifolds, ducts - sounds like music for an architect. It would be a crime to hide all of this. On the other hand we paid attention to the modern approaches of designing utility service systems. 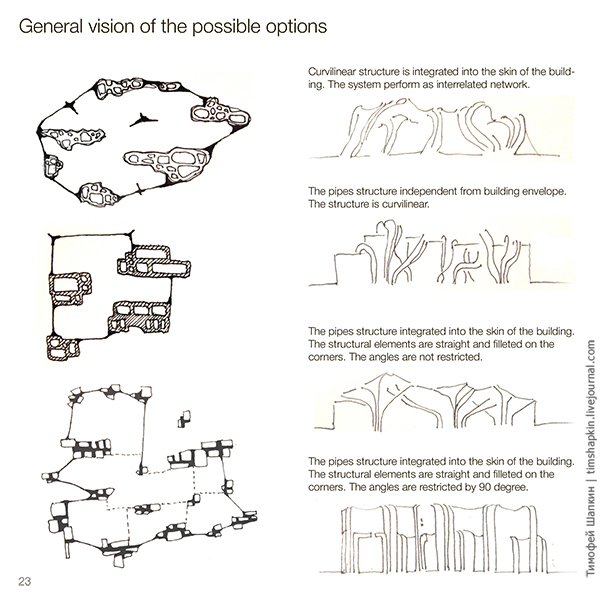 We think the main problem of conventional approach consists in fact that it is usually designed independently to the entire building. The bearing framework is managed by one team of specialists, the service network by another. 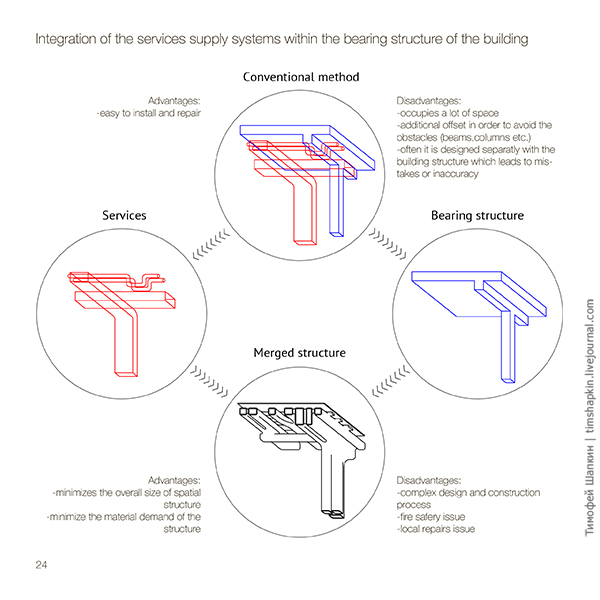 The design approach doesn't suppose any integration between bearing and service system. 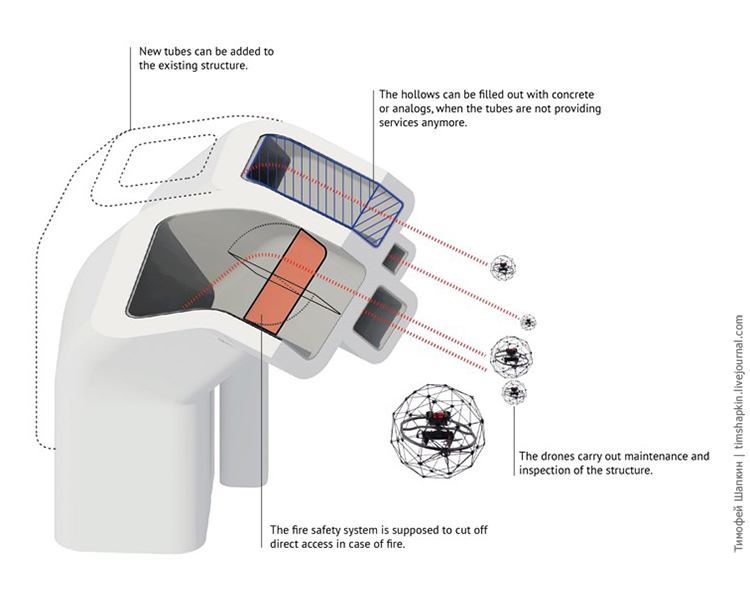 It often causes uncoordinations, ducts should go around the beams and walls generating extra running meters. Thus architects always have to provide more and more space for utility service making the ceilings higher and shafts wider. Conventional design: bearing frame, service frame. The demand in service ducts in great numbers became the starting point in our search for design solutions. While virtual explorations we did physical models in the same time. After very first attempts it became clear that the entire set of channels may function as a frame. The idea was born: merge service channels and bearing frame in one system. Physical models. Polymeric tubes, gauze, a polyester adhesive. The main diagram explains the concept. Except some arguments pro (such as saving space and material) there are some contras. Particularly the problem of fire safety and local repair isn't solved. There is no need to go far for analogs of such systems. This simple idea has long been taken up by nature itself. Let's consider wood for example. 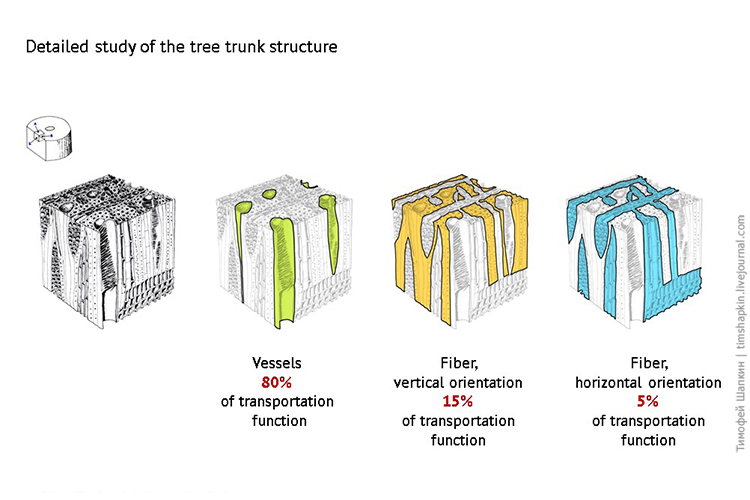 Timber vessels while transporting the water and nutrients have a sufficient rigidity and strength to cope with loads. 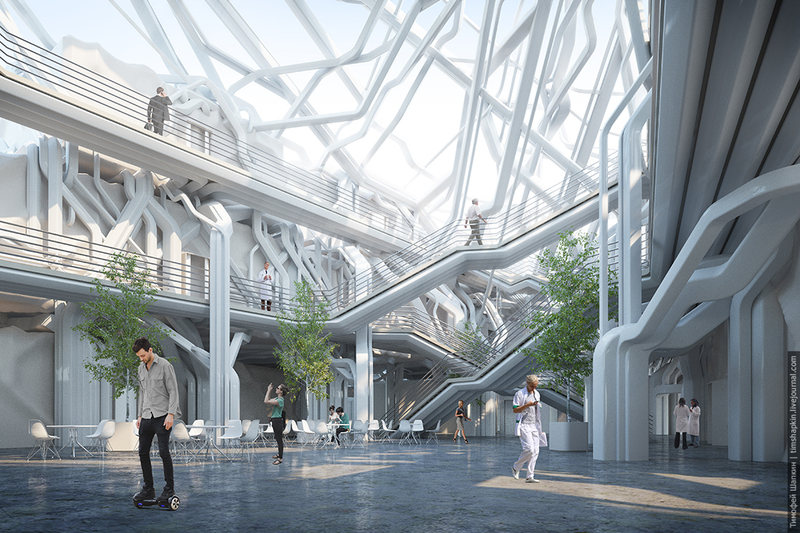 The three-dimensional network of ducts, manifolds and pipes creates a spatially stable structure which encircles and bear blocks of the research center. The Blocks that are bigger and heavier are located on the foundation. 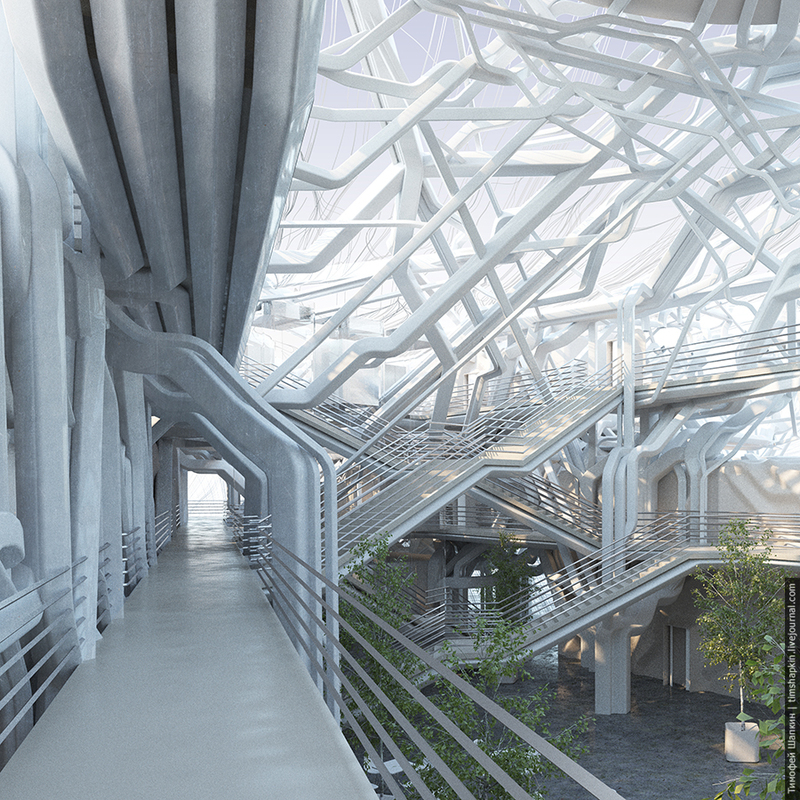 Some of the ducts go to the top, forming a web of overlapping structure over the atrium. At the bottom the tubes are concentrating in bunches like tree trunks, and above, on the contrary, begins to branch. Thus the frame of the building consists of some collection of intertwined trees. The pipes bodies are supposed to be build by C-Fab / Branch techology. This is technology of 3D printing of spatial reinforcement for surfaces of any complexity that can be combined with conventional fillers. 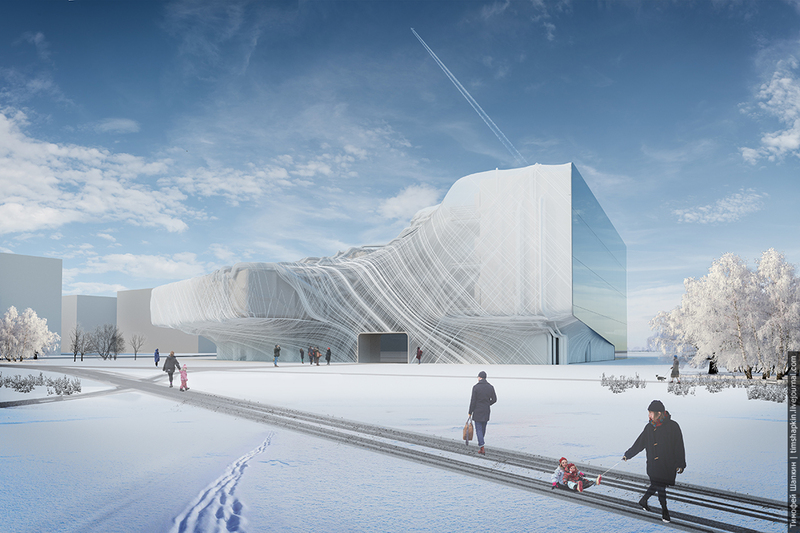 The entire structure of scientific center should be printed piecemeal and assembled together on site. Special attention deserves generating algorithm of the integrated structure. Those who are not interested in computational design can skip this part. The goal of the algorithm is to distribute the utility service network in a way firstly to base the hovering facility boxes on it and secondly find optimal shortest way in space. In order to achieve this we fill the entire inner space except facilities and transport corridors for people with regular points cloud. 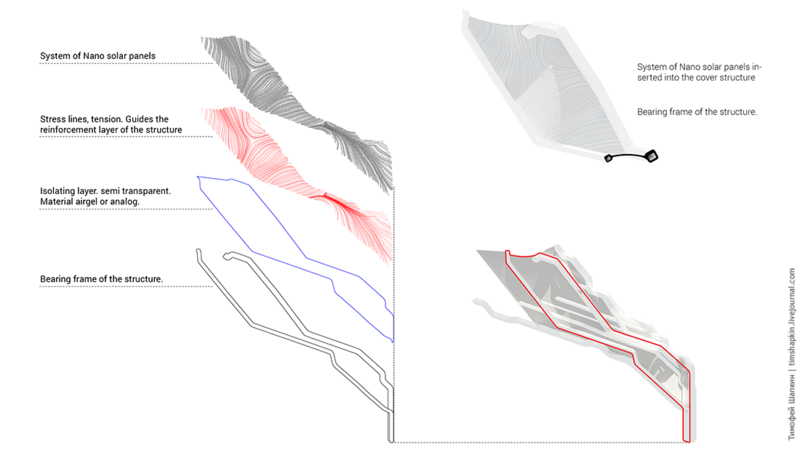 Then we use topology optimization algorithm trough this cloud of points for each hovering facility box. After that we know normal stress pattern in space to bear the boxes. 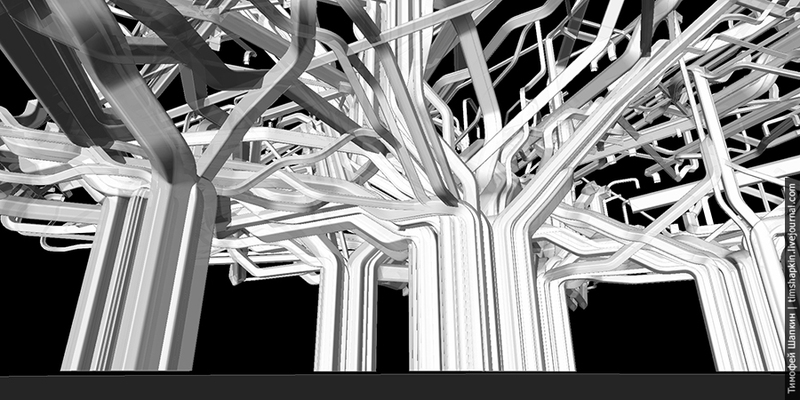 After that through the specified points we generate cloud of lines. The resulting cloud of lines saves regular features. In a simplified sense all the lines have only 0, 45 or 90 angle degree (in fact there are more angles). That principle has defined the circuit-like aesthetics of the structure. 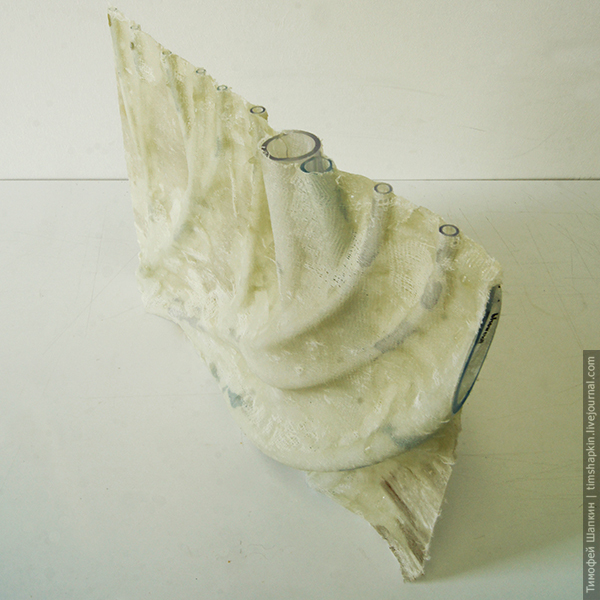 The next step is to define certain amount of ducts, where they start and end. 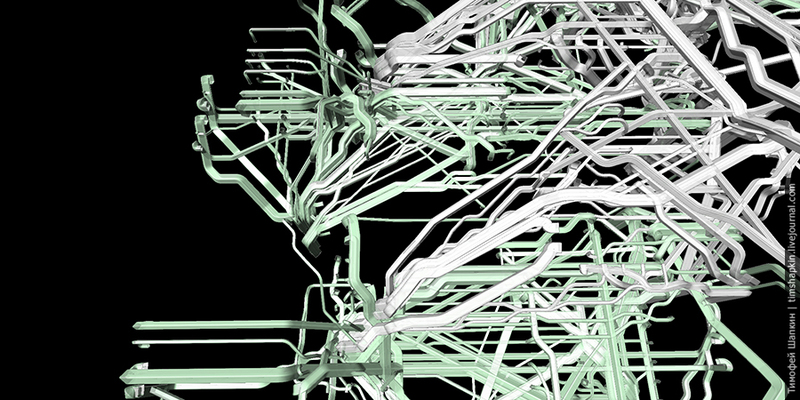 Now we have all the needed data to use shortest walk algorithm which made the resulting pattern of the structure. But that's not all. The final design impression that is coming from rendered images is made by small but important additional layers of algorithm that is responsible for ducts sections, fillets, repulsion of pipes going at the same path, concentration of pipes in bundles at the bottom and so on. The shell was likewise actively parametrized. 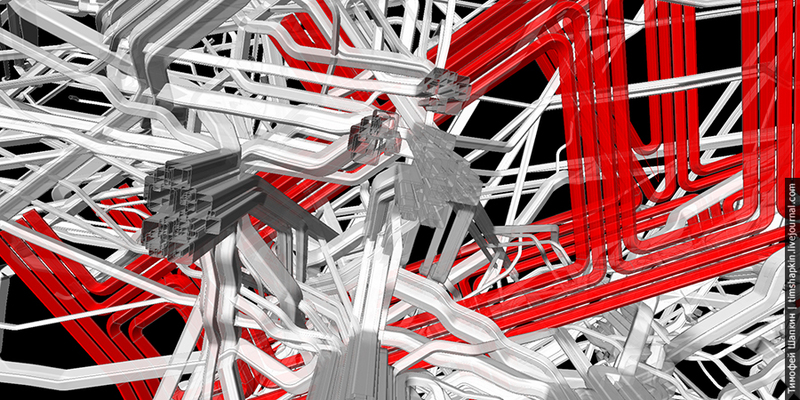 The algorithm we made allows shrink-wrap the complex geometry in several stages, since it does not have enough memory of our computers for the entire operation. During design process we used several add-ons such as Millipede, Kangaroo, Shortest walk, Anemone, Weavebird, Lunchbox, Flowpath. We created more than 30 definition files for the project. So I won't dwell on computational part furthermore, in case you have questions, please write a comment. Let's return to our structure. Most likely in order to ensure the stability of the framework it would require more ducts and pipes than it's really needed for the lab supply. So some of the ducts remain empty, but still with bearing capacity. In the future if it's required empty vessels could be put in operation, or contrariwise the functional ones could be stopped. 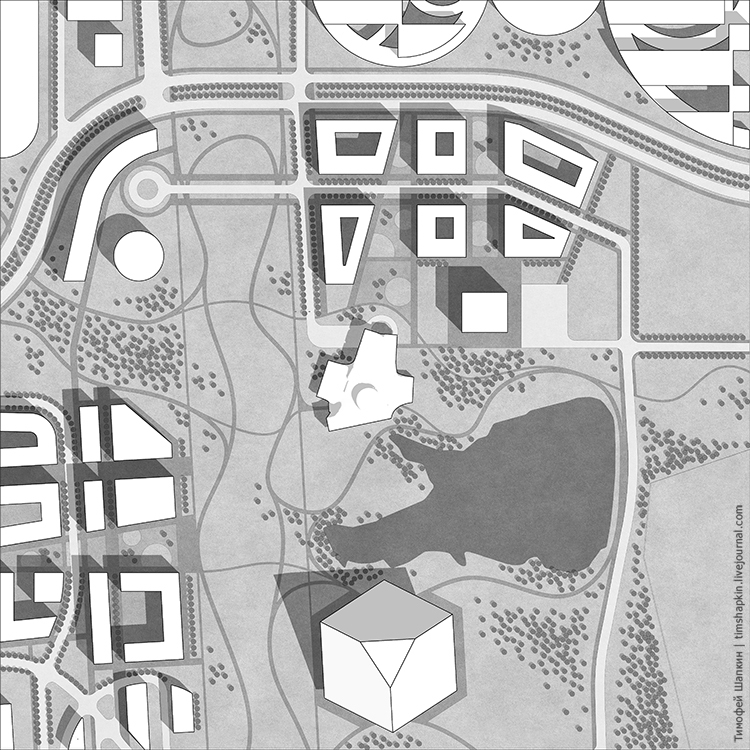 Thereby our proposal suppose flexible functioning, the possibility to be reorganized and modernized. Some of the pipe bundles we can dismantle, another ones grow anew (print it). a step by step. This is a complete living system assuming a step by step evolution. The exterior of science center also discloses a metaphors on the living organism. 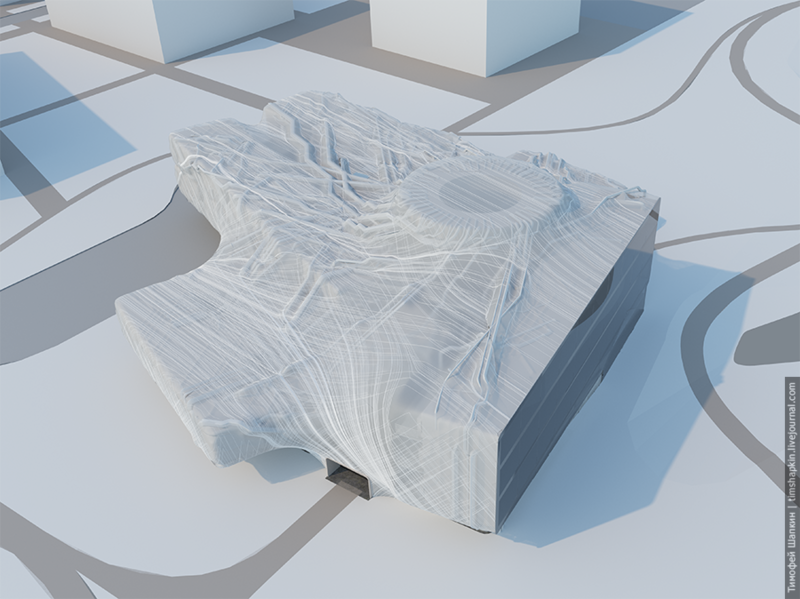 The shell tightly enveloping the structure recalls the veins under the skin or tree roots under the asphalt. The skin of the building heterogeneous. In some places it becomes translucent, letting the scattered light inside. Exterior view. 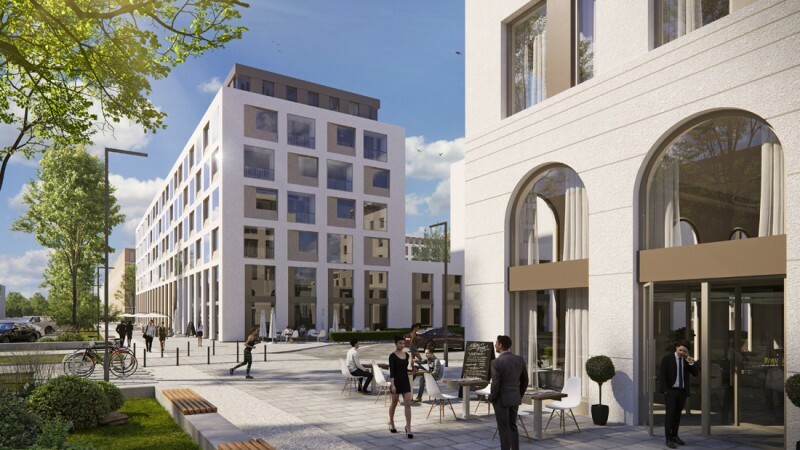 The office block is the only one spot which required conventional glazing. Inner space is rich in public and semi-public spaces. The abundance of trunks makes gradation of spaces of different level of privacy what enables employees to look for a more comfortable surrounding for communication with colleagues. Site plan. 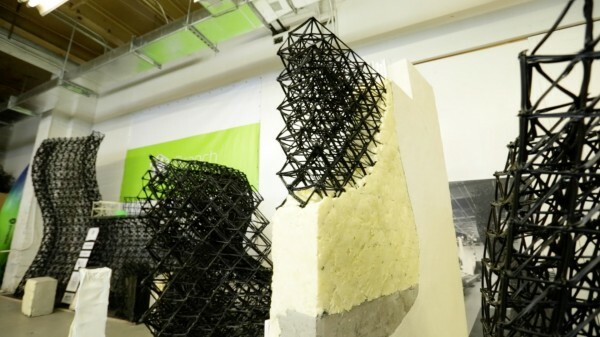 Alleged construction site - Skolkovo..
Model of the fragment. 3D printing + vacuum forming. The thesis offers a number of new ideas and design techniques to solve certain problems. In this case every proposal, designed to solve one problem usually create new problems. Every new solution begets new problems to solve and so on again and again. I agree that the project raises more questions than the answers. I think this is normal, especially for the project, balancing in between something like "castle in the air" and the reality.